← What is the Best Smartphone You Can Buy Today? This article has had over 10,000 views. Thanks for reading it. 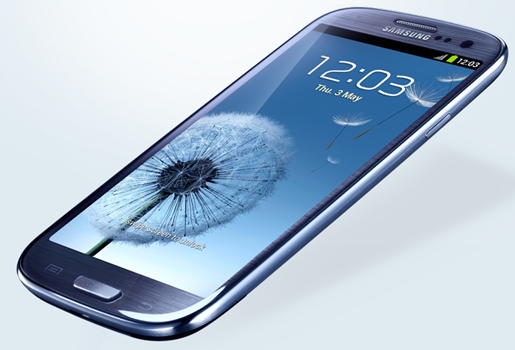 Increase the screen’s brightness – Some reviewers have complained that the Galaxy S III is not as bright as other top smartphones. This is easy to fix. Go to Settings > Display > Brightness and turn ‘Automatic brightness’ off. Then, move the brightness slider to the right and press OK. The screen should now be much easier to read. I run my brightness at about 70% and battery life is still fine. Change the screen timeout – Another easy to fix annoyance is the time before the screen goes to sleep. Go to Settings > Display and change the ‘Screen timeout’ to 2 minutes. This will keep your screen awake much longer, without having much of an affect on battery life. a. Make shortcuts on your home screens for all of your favorite apps. To do this touch ‘Apps’ and then touch and hold an app and then drag it until it appears on the desired home screen. c.	Uninstall any unnecessary apps and widgets. To do this, simply touch and drag them into the trash can in the lower right-hand corner of the screen. d.	Remove any extra home screen panels after you’ve created shortcut for all of your most-used apps. The SIII comes with seven home screen panels, but you can speed up the time it takes to get to your apps if you delete all blank home screen panels. To do this pinch the home screen with two of your fingers. Then drag any blank panels into the trash can. You can add them back later if you want to. a. Start by hiding all of the carrier-installed apps you don’t plan to use. To do this touch Apps and press the Settings button. Then touch ‘Hide applications.’ Touch the black box next to any app you want to hide. When you’re finished, press ‘Done’ in the upper right-hand corner of the screen. b. Next, uninstall all of the apps you don’t plan to use. Details below. c.	If you’re still not satisfied after the above two steps, download SwiftKey 3 keyboard and use it instead of the stock Samsung keyboard. Download the drivers for your phone – If your phone doesn’t mount after you plug it into the USB port on your computer, you may need to download drivers. You can find the USB drivers for the Verizon version of the Galaxy S III here. Check the Samsung website to find the drivers for other carrier’s phones. Expand your memory – If you don’t have an extra 16 or 32GB microSD card laying around, you should purchase one, and copy all of your media to it. You can double the storage in your Galaxy S III for less than $10. This will free up valuable space on your internal memory. Replace some of your Samsung apps with stock ones – Samsung replaces many of the stock Android apps. In some cases, the replacements are better than the originals. In other cases, they are not. Here are 20 stock apps which you may want to consider. Read the manual – There is some valuable information in the Samsung Galaxy S III User’s Guide. You can view it here. Learn how to use the special features which are exclusive to this phone – The “Guided Tours” app has videos which will teach you how to use special features like one touch sharing, pop up play and more. Most of these appear in the “Additional videos” section. Even more videos can be found by searching for “Galaxy SIII” on YouTube. These tips and tricks videos are also worth watching. Where to Find More Great Tips? You can find 30 more great tips and tricks for the Samsung Galaxy S III here. If case you’re wondering why I left out S Beam, I’ve devoted a whole post to that feature. You can no longer drag and drop and app on another to create a folder. To create a folder, click on the Menu button in the lower-left hand corner. You should see a white folder appear on your homescreen. Note: Make sure you only try to do this on a homescreen that has room for the folder to appear. Otherwise it won’t work. Press the Menu button in the lower-left hand corner and touch ‘Uninstall’. Click on the red minus sign to delete an app. Confirm and press the Back button when you’re done uninstalling apps. Note: You can only delete certain apps. If there is no minus sign, you cannot delete them. Touch the Settings button in the lower-left hand corner and touch ‘View Type’. Touch ‘Alphabetical grid’ or ‘Alphabetical list’ shown to the right. Go to Settings > Language and input > and click on the gears to the right of Samsung keyboard. Then touch the words ‘Predictive text’. next, scroll down and touch ‘My word list’ and press “+” to add non-standard words that you type often. Next, touch the trash can icon and delete any words from the list that appear to be gibberish. I found that changing the ‘Word completion point’ from 2 to 3 letters seemed to help as well. If you find ‘Word completion’ to be distracting, turn it off. If you leave it on, don’t fight it. Keep on typing even though it has picked a wrong word. Most of the time it will correct itself later. If you’re moving from an Android 4.0 phone like the Galaxy Nexus, there are some things you need to know to get the most out of your incredible new phone. 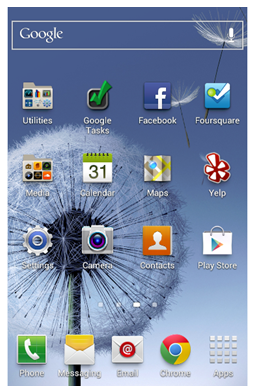 Although the Galaxy SIII runs Android 4.0, there are some differences between Touchwiz and the stock Android 4.0 GUI. This isn’t intended to be a comprehensive list. I’m focusing on the features that I find to be the most useful. 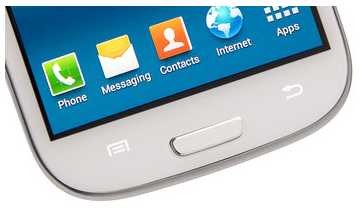 The first thing you’ll probably notice is that there are now three buttons below the massive 4.8” screen on the Galaxy S III. The left button is a menu button which lights up when you touch anywhere below the bottom of the screen. Instead of clicking on the three dots like you can see on the galaxy Nexus screenshot below, you’ll click on the S III’s dedicated menu button. The center button is a real physical home key which does three different things: Pressing it normally takes you to your Home screen. 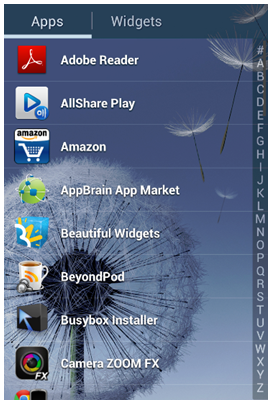 Pressing and holding it, displays a list of recent apps. Quickly pressing it twice launches Samsung’s S Voice, which is similar to Apple’s SIRI. The right button is the back button. This works the same as it did on stock Android 4.0 phones. Instead of viewing your apps by touching the menu button in the upper right hand corner of the Google Play app, you’ll now touch the menu in the lower left-hand corner. There are other differences between the Samsung Galaxy S III and the Samsung Galaxy Nexus. Checkout my next article to learn how to turn off 4G or capture your screen. You’ll find answers to those questions, along with twenty five more tips. If case you’re wondering why I left out S Beam, I’ve devoted an entire article to that alone. You won’t want to miss that one. You’re a lifesaver! I’ve been trying to get rid of that (*&*#&(*&(# media hub for months! Samsung must be reading you. The little red minus sign for Media Hub and Game Hub are no longer present when you click uninstall. El bummer. Otherwise, many thanks, lots of good tips here. how to reduce the usage of ram i recent got an s4 and ive alredy used 1.2 gb wht do i do ? Android does a great job managing memory so you are never going to run out. However, if you want to free up memory press the Home button for 2-3 seconds and touch Task Manager, then select RAM and Clear memory. how do i decrease the speed of my predictvie txt on the keypad. ?? How to i delete widgets permanently from my phone. How do I move APPs from internal SD card to external SD card? Unfortunately you cannot do this at this time. I heard a rumor that Samsung was going to allow this, but that hasn’t happened yet.